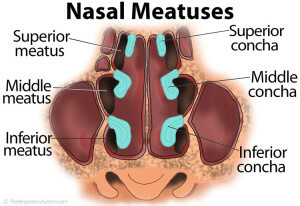 Nasal meatuses are the anteroposterior passages located on the lateral wall of the human nasal cavity. 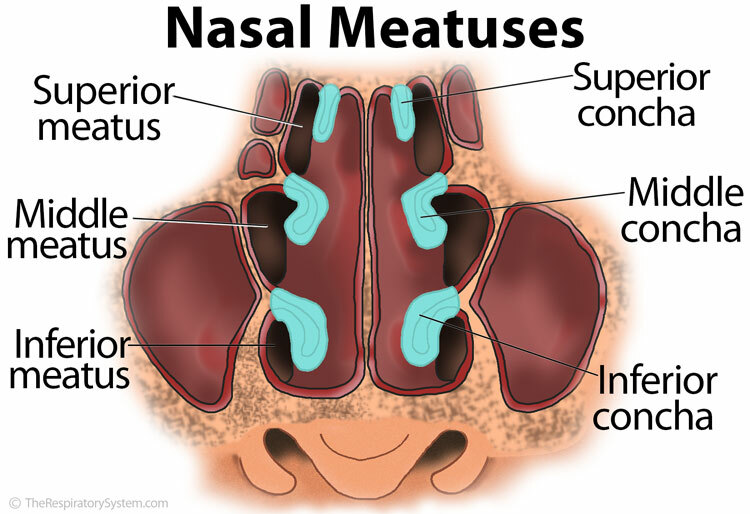 There are three meatuses varying in size, namely the superior, middle and the inferior meatus . The superior meatus, located between the superior concha and the middle concha, is the smallest among the three meatuses. The posterior ethmoidal cells open into the front part of the superior meatus while the opening of the sphenopalatine foramen is behind it. Located above and at the back of the superior concha is the sphenoidal sinus that opens into the sphenoethmoidal recess . Situated between the middle and inferior concha, the middle meatus extends from the starting to the finishing point of the latter. It has a bony projection known as the ethmoidal bulla, which contains the middle ethmoidal cells. The uncinate process, a horn-shaped bony projection, is located beneath this bulla. 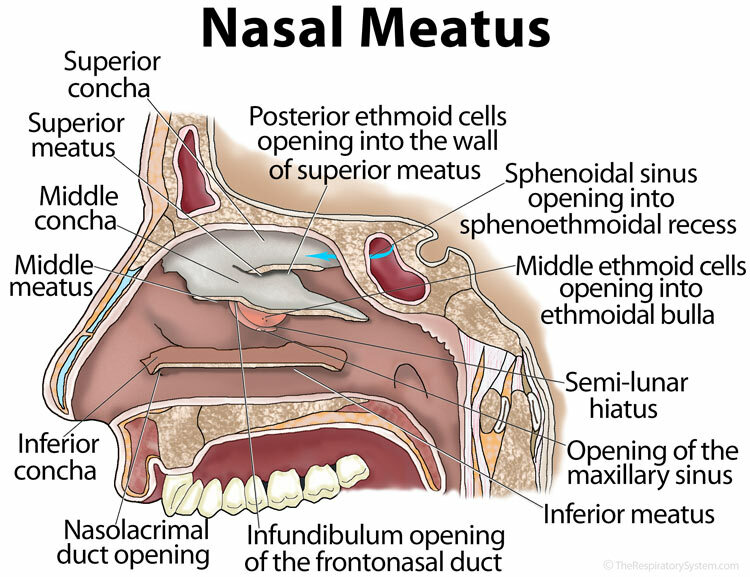 The ethmoidal infundibulum, containing the fronto-nasal duct leads to this process while the duct is connected with the frontal sinus, which empties into the middle meatus. The half moon shaped semi-lunar hiatus is located between the ethmoidal bulla and uncinate process, with the frontal sinus, maxillary sinus and the anterior and middle ethmoid air cells opening into it . 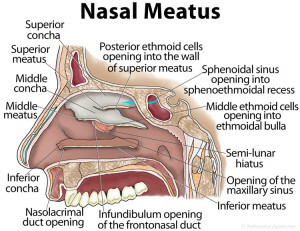 The largest of the three meatuses, the inferior meatus, is located between the inferior concha and the nasal cavity floor, running along the lateral nasal wall . The Nasolacrimal duct and the Incisive canal open into this meatus .